Villa Amy - FREE Wifi, NETFLIX for 6 people! 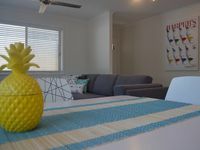 Property 59: Villa Amy - FREE Wifi, NETFLIX for 6 people! 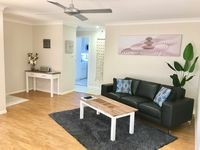 Property 99: Mandurah Canal Holiday Home with own jetty! Boats! Crabs! Dolphins! We so enjoyed our stay in Sawtell! Beautiful walking beach (and surfing! ), lovely cottage, spotlessly clean, well appointed! These 4 Canadians hope to return one day! Thank you! Salt and Sand is a very nice duplex house, private, comfortable and very spacious. Very nicely furnished and modern. Backyard had a nice outdoor setting great for a few drinks and nibbles. Although there is no grass there, we were offered the grassed area at the front behind the garage which was muchly appreciated by our little dogs. Thank you for the welcome pack of cheeses and milk, a nice surprise! House close to beach and local Foodworks, easy drive to Noosa and just wonderful! We can't wait to come back again!